We all want healthy lunch options. But what does that even look like? 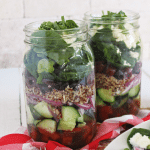 Well it certainly looks a lot like these layered Mason Jar Salads. These salads are easy to assemble and will last you all week! If you have never put salad ingredients into a jar, just know it is very simple and your lunch prep for the entire week is done all in one shot! First pour your dressing into the bottom of the jar, then non-absorbent ingredients (tomatoes, carrots, olives, legumes, etc), then a grain and/or protein, top off with spinach (or greens of choice), and cheese or nuts. Then attach your lid and you’re finished! Try to fill your jars as full as possible to keep all the ingredients crisp and fresh the entire week. I can honestly say, your Friday salad will be just as delicious as your Monday salad. The ingredients really do stay fresh and delicious. When you are ready to eat, shake your jar to allow the dressing to coat all the ingredients. 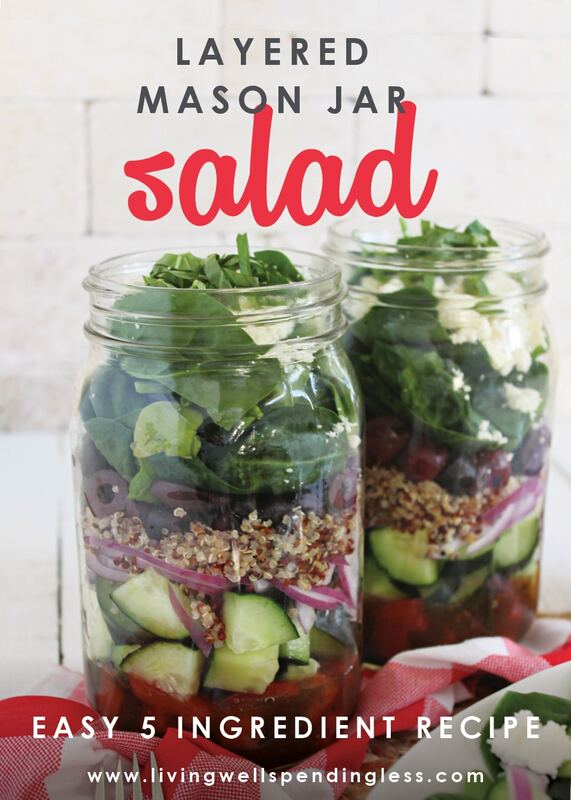 Then you can either eat your salad straight out of the jar or pour the contents onto a plate. The flavor combinations are endless with mason jar salads and I am confident these will quickly become a staple in your lunch routine! Step 1: Chop both cucumbers and the four tomatoes into bite-sized pieces. Cut your small onion in half, save the other half for another recipe. Cut the onion into thin slices. Then take your basil and julienne into thin strips. Set all chopped veggies and herbs aside. 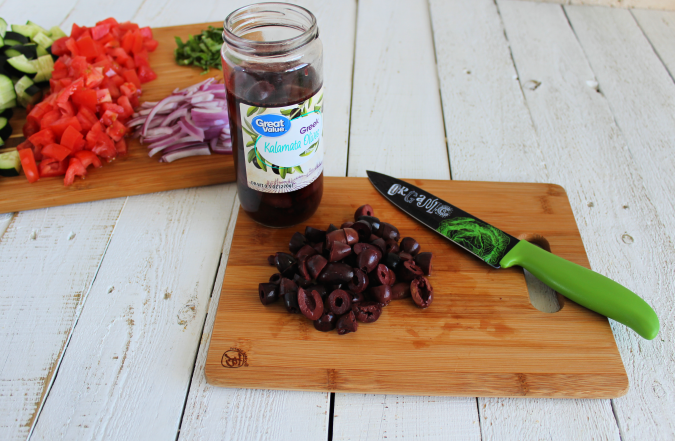 Step 2: Chop about 50 olives in half and set aside. Step 3: Grab your five mason jars and pour a 1/4 cup (or less if you prefer salads with less dressing) balsamic vinaigrette in the bottom of each jar. Step 4: Now we can start layering the ingredients on top of the dressing. Add 1/2 cup chopped tomatoes, then 1 cup chopped cucumber, 1/4 cup sliced red onion, 1/2 cup cooked quinoa, 20 Kalamata olive halves (10 olives total), 1 – 1 1/2 cups baby spinach, 2 Tbsp crumbled feta cheese, and lastly 1 Tbsp or 1 basil leaf pieces. Finish by attaching the lid and storing all the mason jars in the refrigerator. Recipe Notes: Fill your jar as full as possible to keep all the ingredients crisp and fresh the entire week. When you are ready to eat, shake your jar to allow the dressing to coat all the ingredients. Then you can either eat the salad straight out of the jar or pour the contents onto a plate. Don’t forget to pack a fork with your jar! We all want healthy lunch options. But what does that even look like? 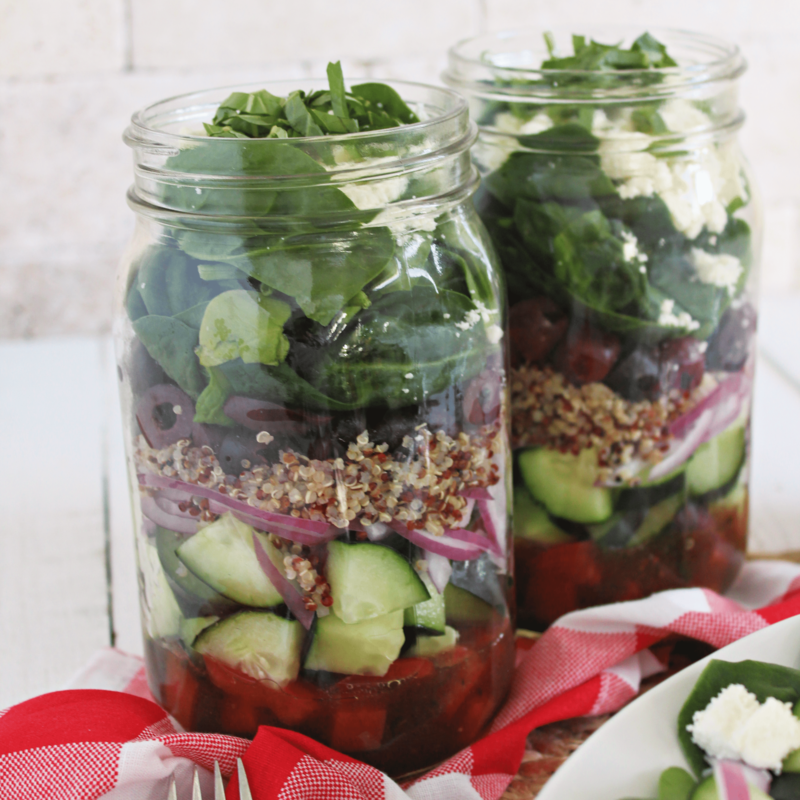 Well it certainly looks a lot like these Greek Mason Jar Salads. These salads are easy to assemble and will last you all week! 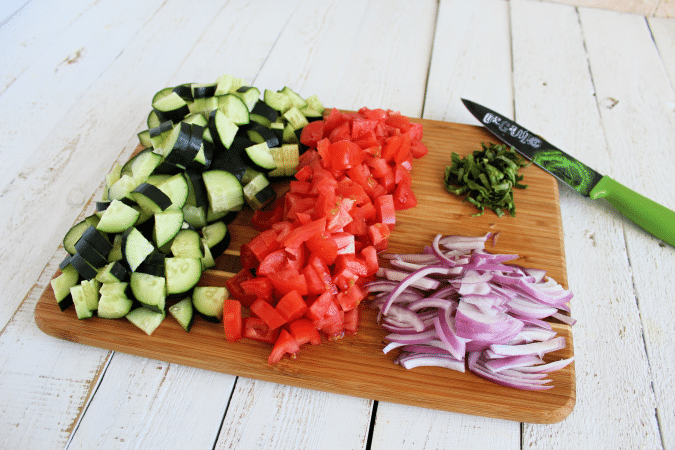 Chop both cucumbers and the four tomatoes into bite-sized pieces. Cut your small onion in half, save the other half for another recipe. Cut the onion into thin slices. Then take your basil and julienne into thin strips. Set all chopped veggies and herbs aside. Chop 50 olives in half and set aside. 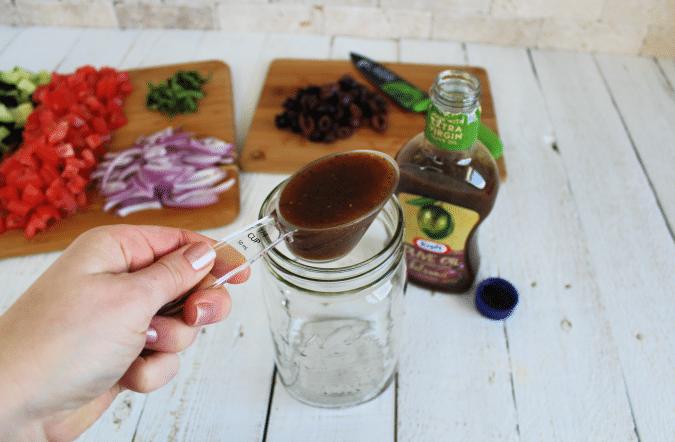 Grab your five mason jars and pour a 1/4 cup (or less if you prefer salads with less dressing) balsamic vinaigrette in the bottom of each jar. Now we can start layering the ingredients on top of the dressing. Add 1/2 cup chopped tomatoes, then 1 cup chopped cucumber, 1/4 cup sliced red onion, 1/2 cup cooked quinoa, 20 Kalamata olive halves (10 olives total), 1 - 1 1/2 cups baby spinach, 2 Tbsp crumbled feta cheese, and lastly 1 Tbsp or 1 basil leaf pieces. Finish by attaching the lid and storing all the mason jars in the refrigerator. 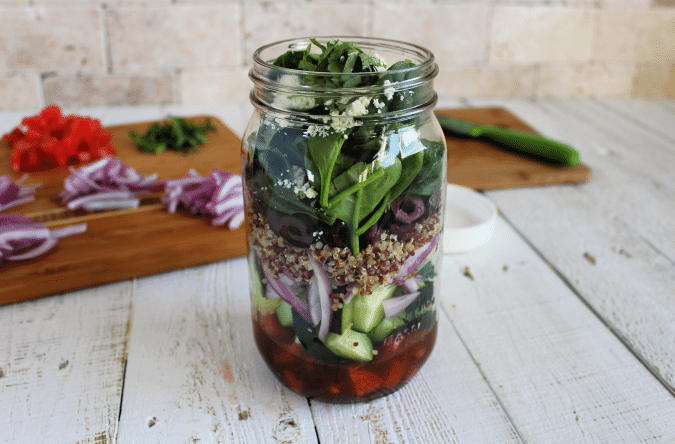 Fill your jar as full as possible to keep all the ingredients crisp and fresh the entire week. 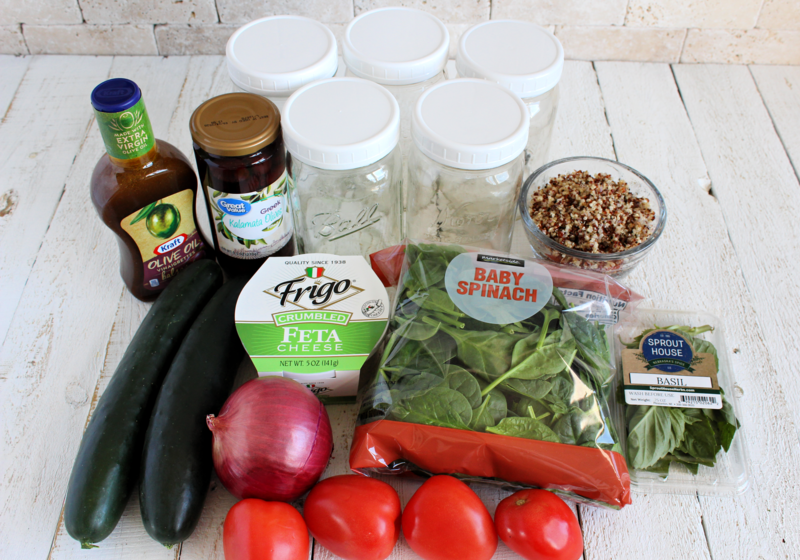 When you are ready to eat, shake your jar to allow the dressing to coat all the ingredients. Then you can either eat the salad straight out of the jar or pour the contents onto a plate. Don't forget to bring a fork with your jar! Sammi Ricke likes to keep things simple, delicious, and nutritious in her kitchen. She enjoys the challenge of finding unique ways to incorporate “just one more whole food” into every meal while leaving just enough room for life’s essentials: chocolate and peanut butter. 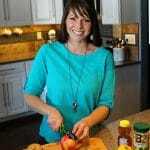 If you are looking for “healthified” versions of your family’s favorite meals be sure to visit Sammi’s Grounded & Surrounded Blog. 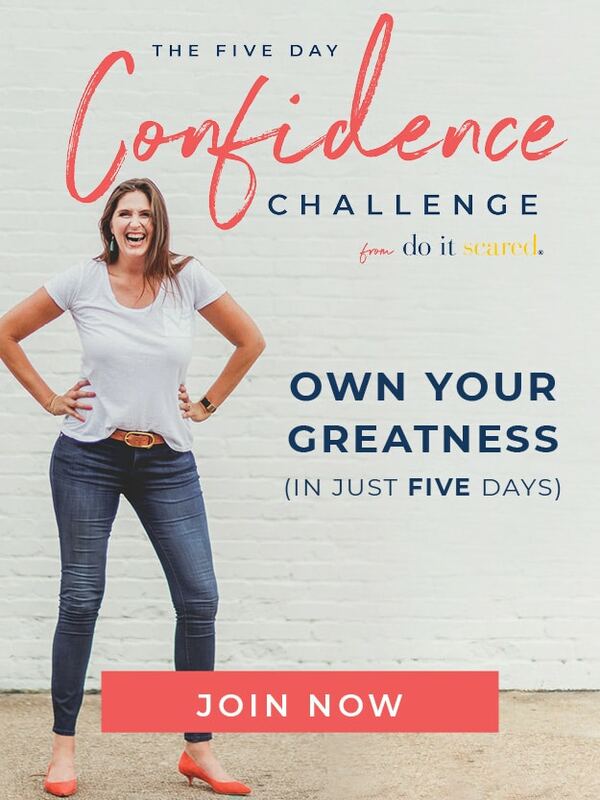 You can also find her on Pinterest, Instagram, and Facebook. My daughter loves using mason jars for her lunches, but she hasn’t done the layered salad in them yet. I imagine a wide mouth jar would be best. Will be sure to pass this idea along to her. Thanks! 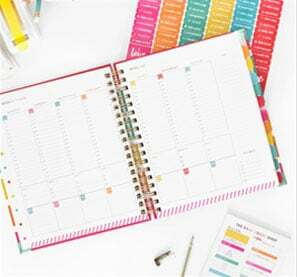 Love this idea and love the idea of having it all ready ahead of time!! Thanks for sharing!! An excellent recipe, and most importantly very helpful all. You know, when all the time to work at the computer or lead a sedentary lifestyle, it is important to maintain your body such Goodies. My friend works in web development and his day is always very busy. He tells what problems are caused by a wrong diet and ignoring meals. I like the Mason jar, concept my concern is the cost to find the jars if you not someone that already has Mason jars, so any other suggestions that could be substituted for the jars. I came to your blog as I’m learning all about blogging since I’m new at it. But wow! What a pleasant surprise to see your guest’s blog post. Just this morning I was thinking, “I need something different with salads. I need to buy more salad ingredients and do something different with them.” This was the inspiration I needed! Thank you, Ruth! When you’re equipped to eat, shake your jar to allow the dressing to coat all of the elements. Then you can either consume your salad straight out of the jar or pour the contents onto a plate. The flavor combos are limitless with mason jar salads and I am assured these will quickly come to be a staple for your lunch habitual.